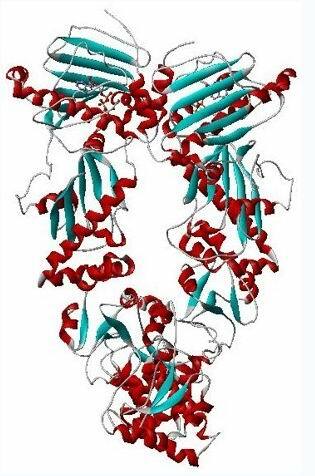 Recombinant Human heat shock protein 90β produced in E. coli has a molecular mass of approximately 85 KDa. The biological activity of GDNF is measured by its ability to support survival and stimulate neurite outgrowth of cultured embryonic chick dorsal root ganglia. Activity can also be measured by its ability to bind recombinant human GFRα1/Fc. Liquid, In PBS buffer, Avoid freeze/thaw cycles. Solid ribbon model of theyeast Hsp90-dimer (α-helices = red, β-sheets = cyan, loops = grey) in complex with ATP (red stick diagram) based onPDB2CG9.